Baron Joseph von Lassberg, Meersburg (ms. 198); Fürstlich Fürstenbergische Hofbibliothek, Donaueschingen (ms. 168); André Hachette (ms. 73); his sale, Paris, Librairie Giraud-Baudin, Dec. 16, 1953, lot 30; purchased there by Arthur Rau, Paris for William S. Glazier (1907-1962), New York; deposited in the Pierpont Morgan Library by the Trustees of the William S. Glazier Collection in 1963. 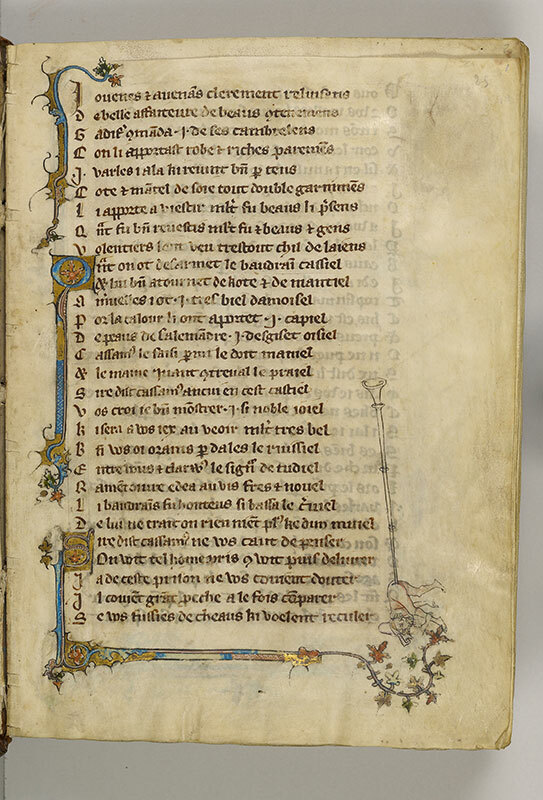 Ms. poetry; written and illuminated in Belgium, probably in Tournai, ca. 1345-1350. Jacques de Longuyon dedicated Les voeux du paon or the Roman de Cassamus to Thibaut de Bar, bishop of Liège, who died in 1312. The Restor du Paon is a continuation of the Voeux written before 1338 by Jean Brisebare (Brisebarre) of Douai. The manuscript is missing three quires of eight leaves each at the start. There are also folios lacking between 88 and 89 as well as between 92 and 93. The end of the book is also incomplete. These gaps are reflected in the two foliations found in the manuscript. The later, continuous foliation (1-141) is used here. The older foliation runs 25-111, 119-122, 125-173. The manuscript originally contained curtains. Decoration: 22 miniatures, numerous illuminated initials with marginal extenders, and marginal figures (pen drawings with color washes).